On facilitation, and does that really happen in your country? Here’s a two-part blog: the facilitation stuff and the “Does that really happen in your country?” stuff. Day 2 is over. It’s a day where we: 1) had our recap by two participants, 2) defined the participatory approach, 3) reflected on our skills as facilitators through a self-assessment questionnaire, 4) identified challenges and strategies to our work, and 5) tried to get our heads around what human rights education means. In the end, there were a couple of things we did not address in the schedule, and that always makes me feel as though I wasn’t doing my job right. But then again, if we respected the schedule to the minute, I’d be wondering whether or not we’re engaging the participants enough. On the one hand, you ought to give the time required in a participatory process such as this one for everyone to express themselves and to contribute to the process. On the other hand, you can’t let things drag on too long. One of the activities, on identifying challenges and strategies to our human rights work, took more time than planned. The three group presentations took over an hour. After the first group I asked everyone what mistake I’d made before the start of presentations and someone gave me the answer I was looking for: I didn’t specify the time each group had to present and discuss. We agreed afterwards on a time limit of 10 minutes each for the remaining two groups; it took 50 minutes. Taking more time for some activities leaves a facilitator with a number of options: 1) race through the rest of the activities and probably annoy most participants in the process, 2) cover all the remaining material without reducing the amount of time required, basically forcing participants to stay in a workshop room from 8:30 in the morning until 6 at night, or 3) cut stuff from the program. So chop away I will. There have been too many times in the past when I’ve said to participants, How about just a few minutes more? Those few minutes at the end of the day are rarely productive and can probably undo any good mood participants are in. So a few things will be dropped from the program, and I don’t think it will adversely affect the ultimate result. The participants seem to be relatively happy (not overjoyed, but happy), so I’ve still got some work to do in order to ensure the energy levels go up and stay that way. Our evaluation at the end of the day helped remind me that a little honesty from participants can help improve what I do. 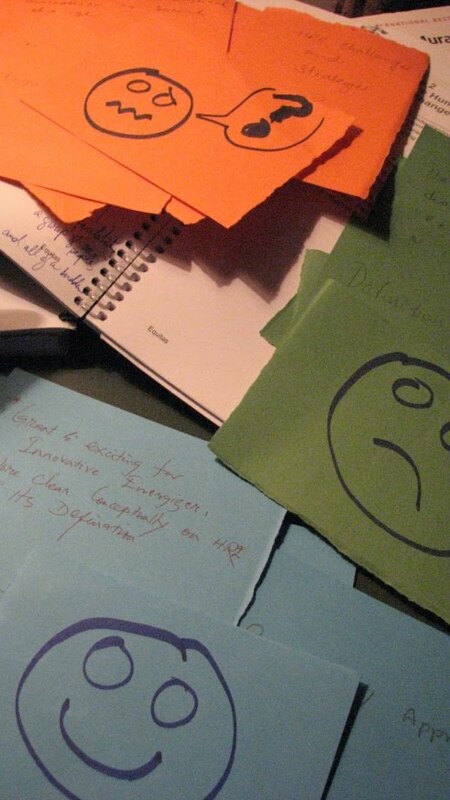 Each participant was given three coloured cards (orange, blue, and green). On each card they had to write something they liked about the day (blue), something they didn’t like so much (green), and something they want to learn more about (orange). Not everyone wrote something in green, but the answers, such as “Sitting on the chair most of the time,” and “Need more constructive discussion about human rights education – challenges and strategies,” help identify some of the stuff I need to improve. Furthermore, in our debriefing at the end of the day with two participants, one of them said quite simply that the day was not productive and that nothing new was learned. We suggested he make amends by pushing participants’ thinking tomorrow during the recap and having them come up with something new. We’ll see what happens. Does that really happen in your country? Figured out which country? How about another one. There’s a country where NGOs must certify their activities every 6 months with their government. NGOs working on different issues are directed to relevant ministries. The problem is, there is no ministry for human rights, so human rights NGOs cannot have their activities certified. If you haven’t figured that one out, here’s an additional clue: it’s a country where the American government contractors outnumber the number of US troops. A here’s a final one that’s a bonus for you all because it’s so easy. In which country are women systematically discriminated against? If you guessed India for the first question, Afghanistan for the second, and all of the countries for the last question, then you’re right on. On tomorrow’s agenda: more on social change and why human rights education can make that happen, identifying and measuring the impact of our work, examining instructional design models, conducting needs assessment, and answering some of the “BIG” questions. Answers tomorrow.